After so many requests, our fifty-seventh Joomla template is created for news portal websites. 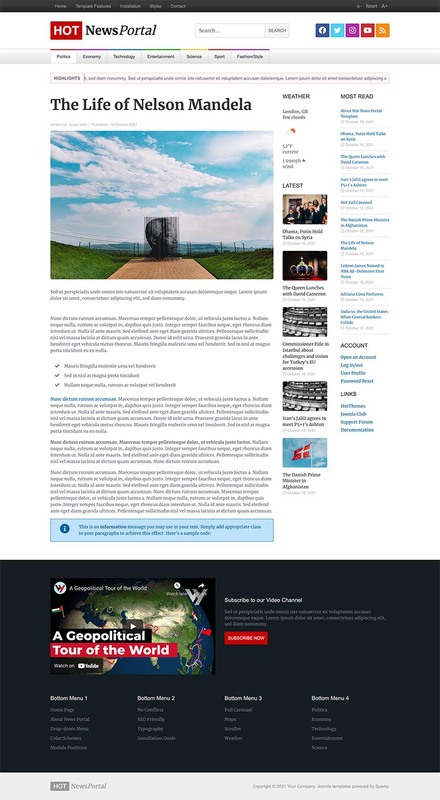 The main purpose of the news portals is to show many information from different fields, in example politics, sport, entertainment, technology, arts, etc. 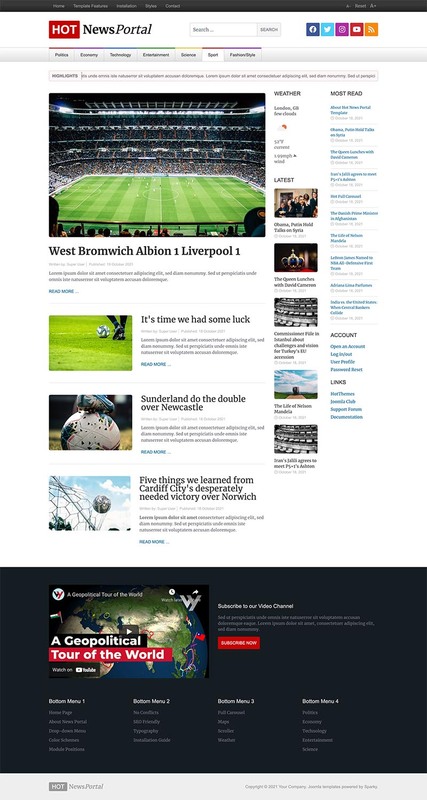 Joomla news template Hot News Portal can be a good starting point in development of such websites. The readers usually visits such portals regularly, on daily basis. The news portals usually publish a lot of news articles every day. It's necessary to classify all these articles by importance and time of publishing. Some of the articles are shown as featured and they are more important, but everything, including the featured articles, is changing every daily. Since readers are visiting such portal often, there should also be some service information, such as weather conditions. This Joomla news template allows you to add this feature easily. Browsing through the tons of information will be easier with easy-to-use search system which is available from all pages. This is available as well. We developed two Joomla modules specially for Joomla news template. The first briefly shows weather conditions for all locations in the world. The second module allows including multiple YouTube videos in the site from a selected YouTube user or playlist. This is a responsive template, based on clean CSS/CSS3 code and powered by Sparky Joomla template framework. Customization of the template's layout and adding/removing module positions is easy. It's powered by Sparky's drag'n'drop Layout Editor. Change layout and element's dimensions of the Joomla news template easily whenever you need. Hot Full Carousel, Hot Video Wall, Hot Weather 2, Hot Maps, Hot Carousel and Hot Gallery modules are included with Hot News Portal template. All commercial modules included in this template are free for you, if you buy template (you save $15 per module). All extensions are pre-installed and configured. 21 module positions are used in our demo. Unlimited number of module positions can be added easily within Layout Editor of Sparky Framework, if needed. Two top menus with presentation of sub-levels as drop-down panes.